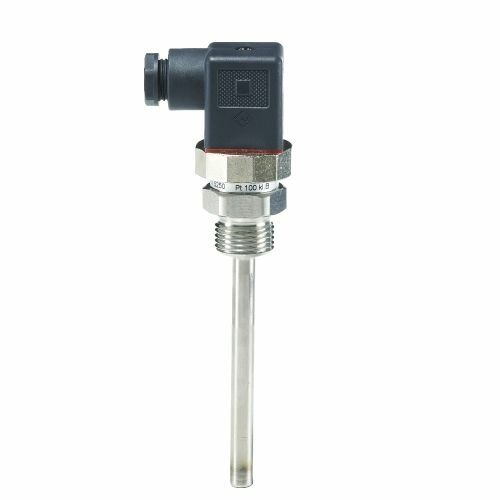 This temperature sensor from Danfoss of the type MBT 5250, is a heavy-duty device that was manufactured for the purpose of controlling cold water, hydraulic oil and lubrication oil in refrigeration plants and other marine and industry applications. It is useful in precisely and reliably measuring temperatures. The measuring insert is located on the base the silicon table and helps make it resistant to vibrations. The parts of this device which come in contact with media are made of stainless steel. The product works well with liquid and gaseous media like oil, gas, air, water, vapor and so forth. The Pt100 and Pt1000 can be connected to two or three wired connections for gaseous and liquid media (air, gas and vapor) or oil at temperatures above 200°C .